Reports and photos from our monthly walks into rainforest and waterfall areas of The Otway Ranges, Victoria, Australia. Also included, will be regular updates on the progress of the feasibility study into the development of designated trails at the back of Apollo Bay. Friends and family will take part in a trek to honour Otways walking track campaigner Les Noseda, who died last September. 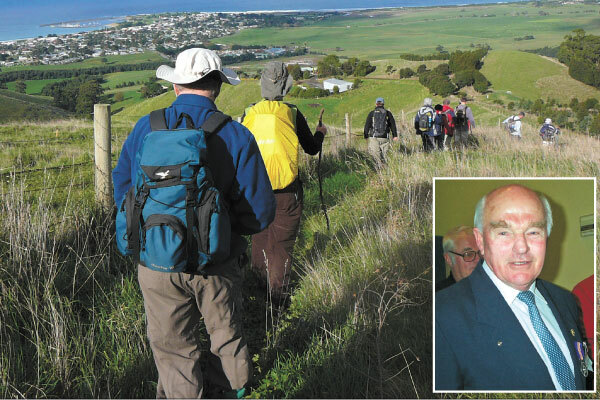 APOLLO BAY Bay residents will mark the anniversary of walking track campaigner Les Noseda’s death by trekking one of his favourite routes. Mr Noseda’s sister Glenda Whelan and son Andrew Noseda wanted to have a memorial walk along Apollo Bay’s Highview Walk and they joined with the Otway Ranges Walking Track Association to organise the event. Mr Noseda, a founding member and former chairman of ORWTA, died on September 15 last year. Mrs Whelan said the memorial walk on September 9 would be a fitting tribute to Mr Noseda. “The Highview Walk goes up Old Tuxion Road, it gets up to Crows Nest at the top of Tuxion, overlooking Apollo Bay,” she said. “This was one of his favourite walks, he used to work up the top of Tuxion at some stage and he used to run past there instead of getting in the car to go home after work. Mrs Whelan said ORWTA members would lead the walkers along the route from Apollo Bay’s visitor information centre from 9am and Crows Nest from 10am. “We’re estimating we could do it very easily, the whole walk, in four hours,” she said. Donations from the walk will go to ORWTA. The association hopes to name the trail after Mr Noseda if it can attract enough funding to improve the track and open it to the public. 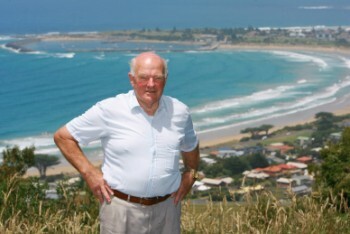 ORWTA has been campaigning for walking trails at Apollo Bay for nearly 20 years. Association treasurer Sue McKenzie said landholders along the 11-kilometre track had given the green light for the memorial walk. “Les helped set up the information centre years ago and he used to take any tourists who wanted to go for a walk,” Mrs McKenzie said. “It was his wish that the track would go ahead, it was probably one of the few things he didn’t get to see in his lifetime but there’s a passionate group of people who are trying to make sure that it does happen,” she said. Les Noseda had a passion for walking in the Otways. The Highview Scenic Walk was one of his favourites. The walk commenced at the corner of Mount Sabine and Curtis roads. We walked some 2.5km down Curtis "road" to where the "road" turns left, then followed a ribboned route through the forest leading approximately south to Cumberland river. We intended to take the nearby route somewhat east of this route, but missed it! Never mind, we arrived at Staircase Falls, and then moved on to the grander Allambee Beek Falls. Drizzly rain and a howling wind in the forest canopy above accompanied us for the rest of the day. The route south went up, sideways, down to a creek, and up finally to a car on Wye River Road, some 3 km east of Mount Sabine Road. (In retrospect, I should have left all the cars but one at the end of the walk.) The company was good, a few great giants among the forest dwarfing us. Most of us ended with coffee at Martian cafe at, of course, Deans Marsh. 5 and a bit hours, including breaks, for the walking. Walkers: Bernard Jordan (leader) Vivian George, Jack Antonas, Sue McKenzie, Alan Dow, Andrew Hackett. The group comprised members of Geelong Bushwalking Club and Otway Ranges Walking Track Association who were not deterred by the drizzly rain that we experienced all day. We commenced the walk at the West Barwon Dam, which was overflowing for the first time in eleven years. We followed one of the walking/bike trails parallel to the reservoir for some 4kms to the Kaanglang Road and thence to the car-park picnic area for lunch. From there we walked to and around Lake Elizabeth. The far end was flooded a few days before, but passable for us. On the return, we chose a different trail on which we saw a solitary cyclist, quite a number of birds, many colourful fungi, and Otway snails that Alan was able to identify. Although the walk is graded Medium, it took us about five and a half hours to complete, but was, nevertheless, enjoyed by all.